Another beautiful week has ended and we do hope it was exciting for you. While you try to rest from the week’s hustle, we bring you a quick summary of the events that happened during the week. Vice President Yemi Osinbajo shakes hands with Google CEO, Sundar Pichai at Googleplex. Nigeria’s Vice President, Professor Yemi Osinbajo, rounded up his 3-day tour of the world’s tech capital, Silicon Valley, on Monday. 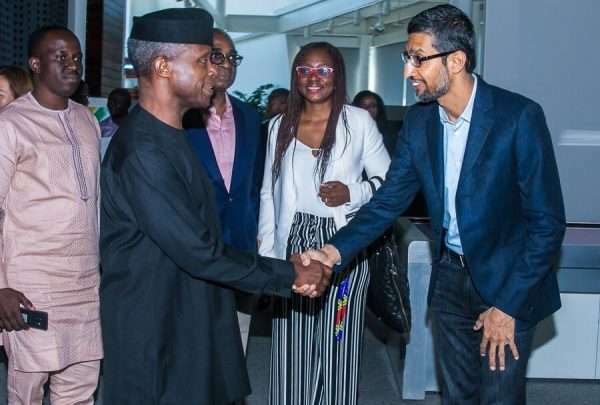 Unlike other visits by a Nigerian leading government official, Prof. Osinbajo was in the Valley headlining a number of tech events and courting new investments in Nigeria’s evolving tech and entertainment sectors. Prof. Osinbajo wasn’t solely in California for tech; he also made a trip to Hollywood to promote Nigeria’s Nollywood industry. According to his media aide, Laolu Akande, the Vice President held meetings with some American entertainment companies. Executives from entertainment powerhouses like Fox, Disney, Warner Bros, and Universal Studios also took part in the meeting. 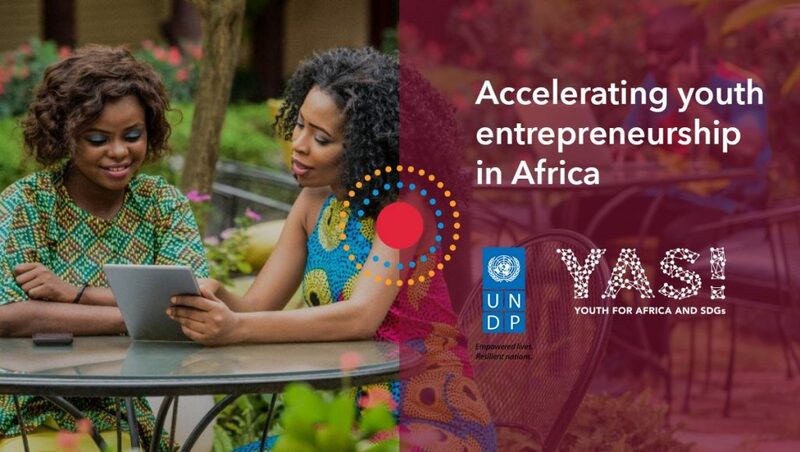 The United Nations Development Programme (UNDP) has launched a Pan-African Entrepreneurship Portal-Platform called YAS! (Youth for Africa and SDGs). Targeted at African entrepreneurs, the portal is designed to promote an online hub for networking, mentorship, funding, information sharing. The SDGs are directed toward ending poverty, protecting the planet and ensuring that people everywhere enjoy peace and prosperity. One key objective of the plan is to provide help to young African entrepreneurs for issues like business plan development. YAS! also aims to act as support human capital development by serving as a matchmaking support system. The YAS! platform will be implemented on two levels. First, it serves as a listing for startups and entrepreneurs. And second, to serve as a hub for private sector donors, investors or incubators seeking startups or looking to support innovators. These startups were selected through a multi-stage process and their services cut across a number of industries including eCommerce, logistics, FinTech, tourism, and data analytics. 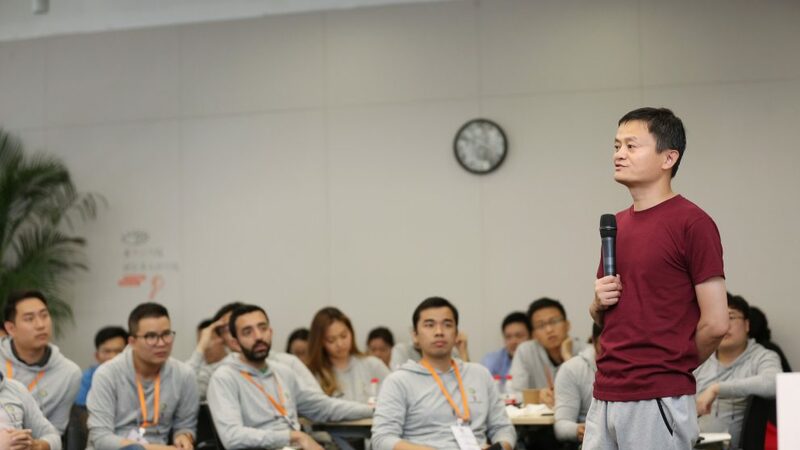 eFounders Fellowship was Founded by Jack Ma, founder of Chinese e-commerce giant, Alibaba. The Fellowship promises to train 1,000 entrepreneurs from various developing countries over the next five years. The two-week course is for entrepreneurs who operate platform-based businesses in the e-commerce, logistics, big data, and tourism industry. The course provides first-hand understanding of digital innovation, using Alibaba and China as a learning curve. DEMO Africa’s founder, disclosed that his team was in talks with private equity firms, pension funds, development finance institutions and high net worth individuals about raising the fund. 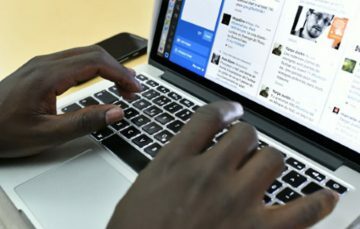 The fund aims to invest between US$250,000 and US$5 million in startups from African countries like Ghana, Nigeria, Kenya, South Africa, and Egypt. 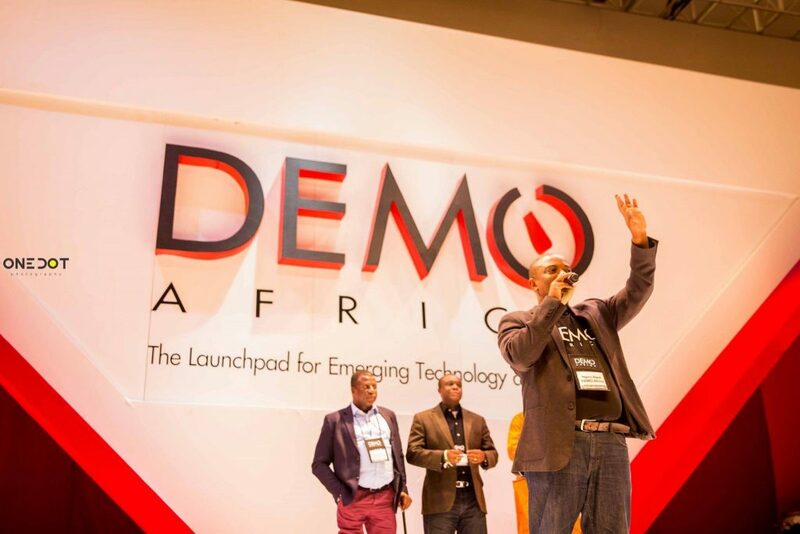 Over the last 6 years, DEMO Africa events have been held in Nigeria, Kenya, South Africa, and now in Morocco. The launchpad supports startups with funding worth over $25,000 and supports them with software tools from Microsoft and Amazon. DEMO Ventures looks set to take advantage of this prior experience and startup support network. The DEMO Ventures fund will be led by Tania Ngima, who brings in her over 15-years investing experience into the mix. “Tania has the unanimous support of our board of directors and strategic partners,” Hare concluded. The event held in GRA-Ikeja, Lagos yesterday and experienced a huge turnout from entrepreneurs to representatives of startups in the tech ecosystem who shared innovative ideas and learned from an experienced administrator/entrepreneur, Mr Obafela Bank-Olemoh. Sharing from his wealth of experience, his presentation captivated the hearts and minds of the attendees. One solid point he shared was that entrepreneurs must first believe in their dreams to excel and give their best to actualizing these dreams, even if it means cutting off some lifestyle habits and engaging in some others. "The most difficult job you have when you start a business is human relations because you're selling YOU! You must model what you want to see. Also management of your finances has a lot to do with personal discipline." 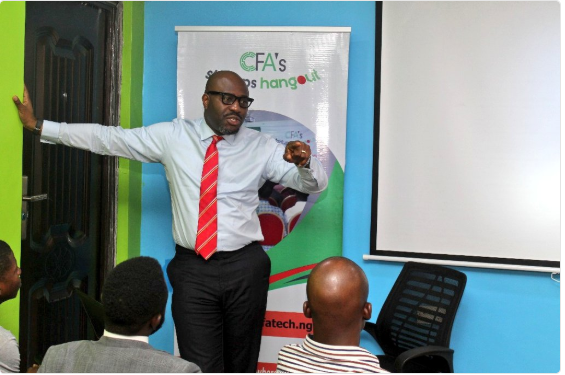 Indeed, the July Edition of the CFA’s Startups Hangout really lived up to expectations as the entrepreneurs were fed with priceless nuggets on how to run their businesses, endure through the trying times, and come out successful. Kudos to the CFAtech team for such an eventful hangout! That is it on our weekly roundup and we do hope you enjoyed it.